A 95-year-old World War II veteran captured the world’s heart last month when his daughter put out a request to send him birthday cards. 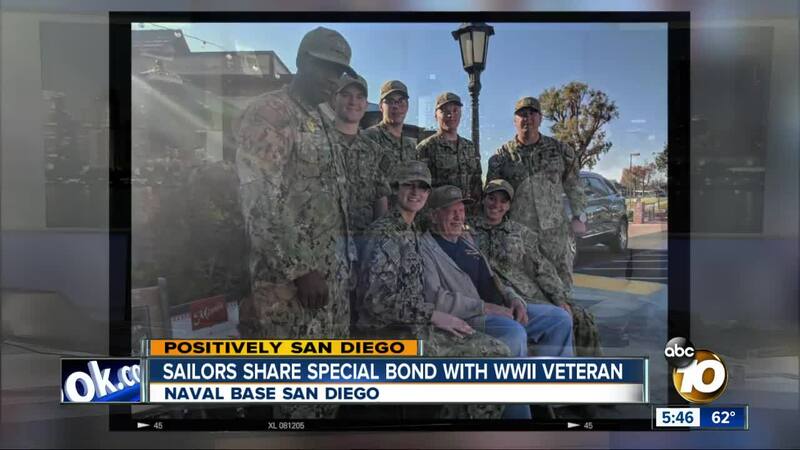 SAN DIEGO (KGTV) -- A 95-year-old World War II veteran captured the world’s heart last month when his daughter put out a request to send him birthday cards. People all over the U.S. stepped up, including local sailors who share a special bond with him. These sailors from the USS Cowpens are the Navy's new generation of sonar technicians, they're responsible for underwater surveillance. "We're kind of a small community, where even if you stay in you have to go back to Point Loma for refresher schools,” said Colette Javner, USS Cowpens Sonar Technician. When Javner heard about WWII veteran Duane Sherman's quest for hand-written birthday cards, she wanted to learn more about him. It didn't take long to figure out they had something in common. "He was, as we call, one of the OG's, he's the grandfather of sonar, when he came in sonar was still a very new rate,” said Javner. She and fellow USS Cowpens had never met a sonar technician from the WWII era. As birthday cards poured in for the Purple Heart recipient, the Cowpens were making plans of their own. "When I found out he lived so close I wanted to meet him that day,” said Tyler Lunn, USS Cowpens Sonar Technician. The sailors traveled hours to spend the afternoon with Sherman, hanging on to every word of every story. "I don't think he was expecting such a large group of sailors wanting to meet him, he was our celebrity,” said Javner. Separated by generations, but connected through their love of country. "If they're watching I cannot convey how much we appreciate them, they are called the greatest generation for a reason, I hope one day we can live up to that generation,” Javner added.